Many saints have, through contemplation of the cross, received spiritual direction from the Holy Spirit. contemplation we can be helped to bring low our pride and mortify ourselves. Am I truly united with Christ in his sufferings? Do I complain frequently when I suffer? How does my poverty and humility compare to that of Christ? Do I understand the great sacrifice of love which God has given to me? How do I make the message of God’s love and sacrifice known to others? How much gratitude do I show to God for his gifts to me? What does the crucifix show me with regard to the need to improve my Spiritual life? What is God trying to teach me through this contemplation? Cross and follow Him who died for us. These fourteen steps that you are now about to walk you do not take alone I walk with you. Though you are you, And I am I, Yet we are truly one, one Christ. And therefore My way of the cross Two thousand years ago, and your ‘way’ now are also one. But note this difference My life was incomplete until I crowned it by my death. Your fourteen steps will only be complete when you have crowned them by your life. In pilate’s hands I see my Father’s will. Though Pilate is unjust, he is the lawful governor and he has power over me. And so the Son of God obeys. 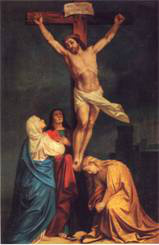 If I can bow to Pilate’s rule because this is my Father’s will, Can you refuse Obedience to those who I place over you? I take up my daily cross I welcome the monotony that often marks my day, discomforts of all kinds. the summer’s heat, the winter’s cold my disappointments, tensions, setbacks, cares. Remind me often that in carrying my cross, I carry yours with you, and though I bear a sliver only of your cross, You carry all of mine, accept a sliver, in return. The God who made the universe and holds it in existence by his will alone, becomes a man, too weak to bear a piece of timber’s weight. How human in his weakness is the Son of God. My Father willed it thus. I could not be your model otherwise. If you would be my other self, You also must accept without complaint your human frailties. Lord Jesus, how can I refuse? I willingly accept my weaknesses, my irritations and my moods, my headaches and fatigue, all my defects of body, mind and soul because they are your will for me, These “handicaps” of my humanity I gladly suffer them. Make me content with all my discontents, but give me strength to struggle after you. My Jesus, Lord, I know what you are telling me.To watch the pain of those we love is harder than to bear our own.To carry my cross after you, I, too, must stand and watch the sufferings of my dear ones – the heartaches, sickness and grief of those I love. And I must let them watch mine, too. I do believe for those who love you all things work together unto good. My strength is gone;I can no longer bear the cross alone And so the soldiers make Simon give me aid. This Simon is like you, my other self. Give me your strength. Each time you lift some burden from another’s back you lift as with your very hand the cross’ awful weight that crushes me. Lord, make me realize that every time I wipe a dish pick up an object off the floor, assist a child in some small task, or give another preference in traffic or in the shop; each time I feed the hungry, clothe the naked, teach the ignorant, or lend my hand in any way –It matters not to whom – my name is Simon. And the kindness I extend to them I really give to you. Can you be brave enough to wipe my bloody face? Where is my face, you ask? At home whenever eyes fill up with tears, at work when tensions rise, on playgrounds, in the slums, the courts, the hospitals, the jails wherever suffering exists my face is there. And there I look for you to wipe away blood and tears. Lord, what you ask is hard it calls for courage and self-sacrifice, and I am weak. please, give me strength. don’t let me run away because of fear. Lord, live in me and act in me and love in me. And not in me alone, in all of us so that we may reveal no more your bloody but your glorious face on earth. This seventh step is the one that tests your will. From this fall learn to persevere in doing good the time will come when all your efforts seem to fail and you will think, “I can’t go on.”Then turn to me my heavy-laden one and I will give you rest. Trust me and carry on. Give me courage, Lord. When failure presses heavily upon me and I am desolate, stretch out your hand to lift me up. I know I must not cease but persevere In doing good. But help me, Lord. Alone there is nothing I can do. With you, I can do anything you ask. I will. How often had I longed to take the children of Jerusalem and gather them to me but they refused. But now these women weep for me and my heart mourns for them –mourns for the sorrow that will come I comfort those who seek to solace me. How gentle can you be, my other self? How kind? My Jesus, Your compassion in your passion is beyond compare. Lord, teach me, help me learn.When I would snap at those who hurt me with their ridicule, those who misunderstand or hinder me with some misguided helpfulness, those who intrude upon my privacy – then help me curb my tongue. May gentleness become my cloak. Lord, make me kind like you. Completely drained of strength I lie, collapsed, upon the cobblestones. My body cannot move. No blows, no kicks, can rouse it up. And yet my will is mine. And so is yours. Know this my other self, Your body may be broken, But no force on earth can take away your will Your will is yours. My Lord, I see you take a moment’s rest and then rise and stagger on. So I can do because my will is mine. When all my strength is gone and guilt and self-reproach press me to earth and seem to hold me fast, protect me from the sin of Judas – save me from despair! Lord, never let me feel that any sin of mine is greater than your love. No matter what my past has been I can begin anew. Behold, my other self, the poorest king who ever lived. Before my creatures I stand stripped. The Cross – my deathbed – Even this is not my own Ye who has ever been so rich possessing nothing, I own all – My Father’s love. If you, too, would own everything, be not solicitous about your food, your clothes, your life. My Lord, I offer you my all – Whatever I possess and more, myself. Detach me from the craving for prestige,position, wealth. Root out of me all trace of envy of my neighbour who has more than I. Release me from the vice of pride, my longing to exalt myself, and lead me to the lowest place. May I be poor in spirit, Lord, so that I can be rich in you. Can you imagine what a crucifixion is? My executioners stretch my arms they hold my hand and wrists against the wood and press the nail until it stabs my flesh. Then, with one heavy hammer smash, they drive it through – and pain bursts like a bomb of fire in my brain. They seize the other arm, and agony again explodes, then raising up my knees so that my feet are flat against the wood, they hammer them fast, too. My God, I look at you and think: Is my soul worth this much? What can I give in return I here and now accept for all my life whatever sickness, torment, agony may come.To every cross I touch my lips. O blessed cross that lets me be with you – a co-redeemer of humanity. The cross becomes a pulpit now “Forgive them, Father…..You will be with me in Paradise…There is your mother…There…your son…I thirst… It is accomplished.” To speak I have to raise myself by pressing on my wrists and feet, and every move engulfs me in new waves of agony. And then, when I have borne enough, have emptied my humanity, I let my mortal life depart. My Jesus, God, What can I say or do?I offer you my death with all its pains, accepting now the time and kind of death in store for me. Not by a single instant would I lengthen my life’s span. I offer you my death for my own sins and for those of all humanity. My God! My God! Forsake us not. We know not what we do. I beg you, Lord, help me accept the partings that must come –from friends who go away, my children leaving home, and most of all my dear ones when you shall call them to yourself Then, Give me the grace to say; “As it has pleased you, Lord, to take them home, I bow to your most holy will and if by just one word I might restore their lives against your will, I would not speak.”Grant them eternal joy. So ends my mortal life. But now another life begins for Mary and for Magdalen for Peter and for John and you… My life’s work is done, My work within and through my Church must now commence, I look to you, my other self. Day in, day out, from this time forth, be my apostle – victim – saint. My Jesus Lord You know my spirit is as willing as my flesh is weak. The teaching you could not impart, the sufferings you could not bear, the works of love you could not do In your short life on earth, Let me impart, and bear, And do through you. But I am nothing, Lord. Help me. So seek me not in far off places. I am close at hand, at your work bench, in your office and kitchen in your bed of illness and pain, in all your anxieties, fears, and worries these are your altars where you offer love. And I am with you there. Go now! Take up your cross and with your life complete your way. Remember I am with you always.